I am disappointed News Corp. management permitted the publishing of the Mark Knight cartoon of Serena Williams in the Herald Sun today. What I see is a racist cartoon that panders to a racist agenda News Corp tabloids favour. The cartoon is not funny. Knight has been out in the media today defending the cartoon. If the cartoon was abut a hissy fit then he could have made it about that. Instead, he made this race-hate piece. While we newsagents are not censors, I am not happy selling a newspaper with this in to. However, I take comfort that I am not in Sydney and having to sell the Daily Telegraph, which is more trashy more often. Did we take the Herald Sun off the shelves? No. As I noted, we are not censors. Knight has a right to create a racist cartoon and News Corp. has a right to publish these. The best thing we can do is not buy the product. I see a spoilt brat, bad sport that couldn’t take the decision. totally unbecoming of such a great star. Whether the umpire was right, he was the umpire and there are other ways to challenge decisions. The cartoon is ugly, Serena’s behaviour was ugly, the booing by the crowd was ugly and Naomi Osaka’s greatest sporting moment has become a forgotten footnote to the whole ugly saga. It’s time everyone involved gave some thought about the actual winner of the US women’s open and stopped trying to turn it into a gender/race war. Really Fletch. Can you show me the racist element in this cartoon. I see the characterisation of Ms Williams exactly how she acted yesterday, bloody shameful. To call it racist, or even sexist, is way out of court. Do we remember her ? She has recently won the US Open without a tantrum and playing through the games with respect for her opponent and the Umpire and his decisions. To have a sports umpire called a thief and a liar during a game is disgraceful. 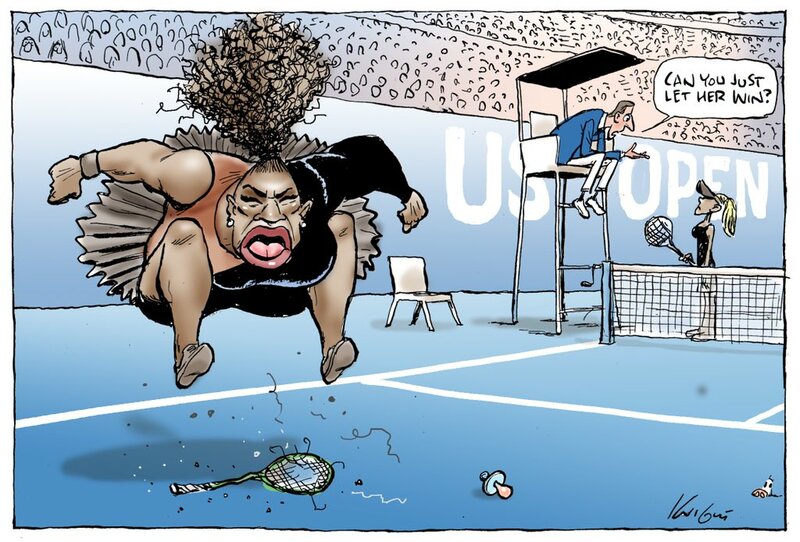 That cartoon is not racist in my eyes, it’s simply a caricature, and after seeing the performance put on by Williams, I reckon it’s pretty close to the mark. She’s a great sportswoman, she didn’t need to carry on like that. Naomi Osaka, now there’s another great sportswoman with a little more dignity. I disagree entirely. Not racist at all in my view, but rather a caricature of a high profile person having a tanty. Serena is of African American descent, and the cartoon portrays her as such. That is not racist. It is just such a shame that so often a controversial topic has the racist label thrown at it simply because it is controversial and has sweet FA to do with race. This just distracts from the real message, which is this behaviour – irrespective of who displays it – is not acceptable in the modern professional sporting arena and should be called out. No one throws the racist card at the illustrated depictions of Nick Kyrgios and his disgraceful behaviour. It’s racist without a doubt. David, how is it racist? I am not sure what I have missed that makes it racist. The complexity is that racism, or not, is in the eye of the beholder. I have no interest in agitating people to my opinion. I wrote what I wrote for myself and not to convince people as this is a topic on which that is unlikely to happen. That said, for me, the depiction of both players is racist. Osaka is not white with blond hair. Williams is not represented in the image Knight has drawn. He has selected a style that makes a racial point. What is lost, for me, is what the real topic should be and that is the poor on-court behaviour. If I was the editor I’d have rejected this cartoon and said stick with the topic and make it less about race and more about the behaviour. A good and sensible comment. Had Selena taken the call with grace she would have won fans even if she lost the game. It’s about sportsmanship Whoops P.C. uhmm- well good manners. As for cartoonists there job is one of a commedian or satirist in print if you like they over illustrate the obvious to get the point accross. Just for laughs. PLEASE… you only do that in front of the mirror in the morning with no listening but yourself…which Weetie pack do you thing we all came out of? Guess that’s the end of the Bald Archy’s – I used to enjoy them ! Political Cartooning began with newspapers, some of the ones from the 1800’s UK are brutal. The joy in life is being squeezed out of everything by the wowsers these days. I’m not sure who you are referring when you say God is a wanker? or who is the wanker? I would like to read what you really think and why rather than take the Higher moral ground of one thouht prevails all which your statement excludes. You may have a very good point however it’s not transparent. Graeme, please quote the correct numbered post. I’m at No. 18. I’ll rephrase my comment just for you. OMG Fletcher you’re a wanker at times. Some of us don`t see the race only see the person. Absolute rubbish. This is a cartoon about a black girl having a temper tantrum. Obviously in this PC- driven world replete with trigger warnings and safe spaces, black women are now off limits for cartoonists.